There is hardly a time that I'm not wishing to be at the beach! 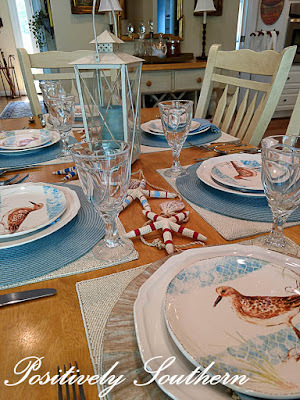 I've done my best to surround myself with things that I adore and beach or coastal pieces are among those! 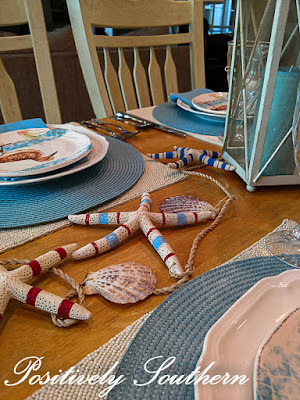 Anytime I see beachy items I do my best to see how I can incorporate those into our home. When I saw the chargers that look like driftwood I knew they would be a great addition to my beach collection. 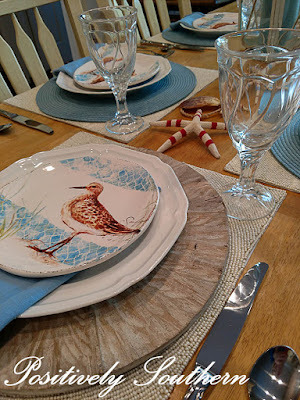 The cream beaded placemats were quite possibly the best addition to my table linen collections. 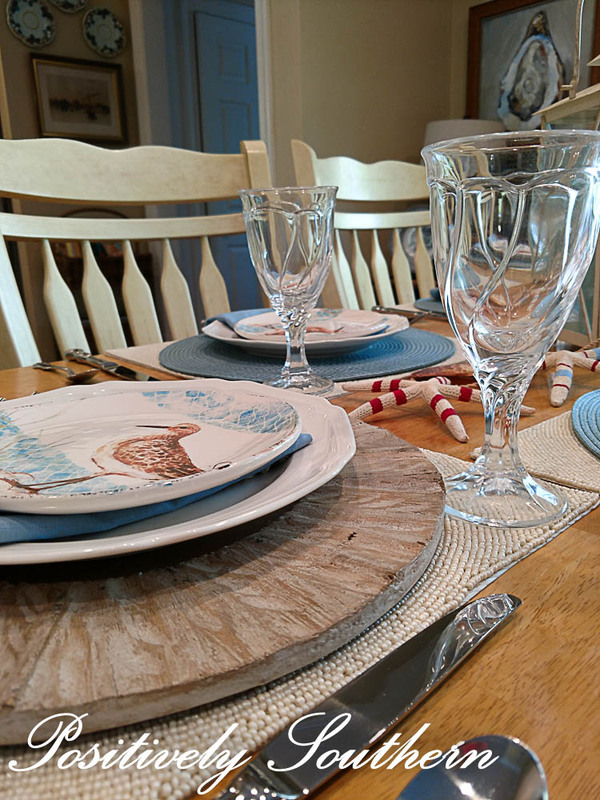 They stay in almost a constant rotation of tablescapes. Pairing this with the the wooden chargers really make the sandpiper plates pop! 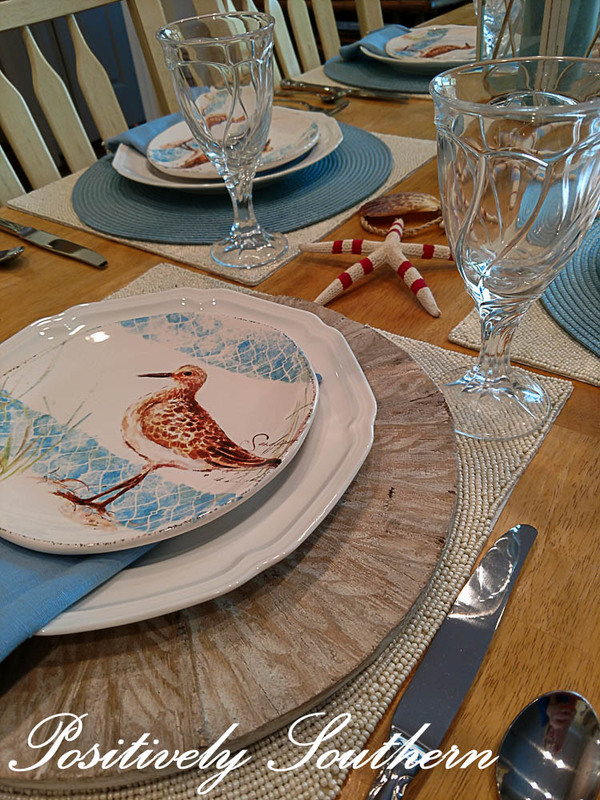 The woven placemats add a complimenting color to the sandpiper plates. 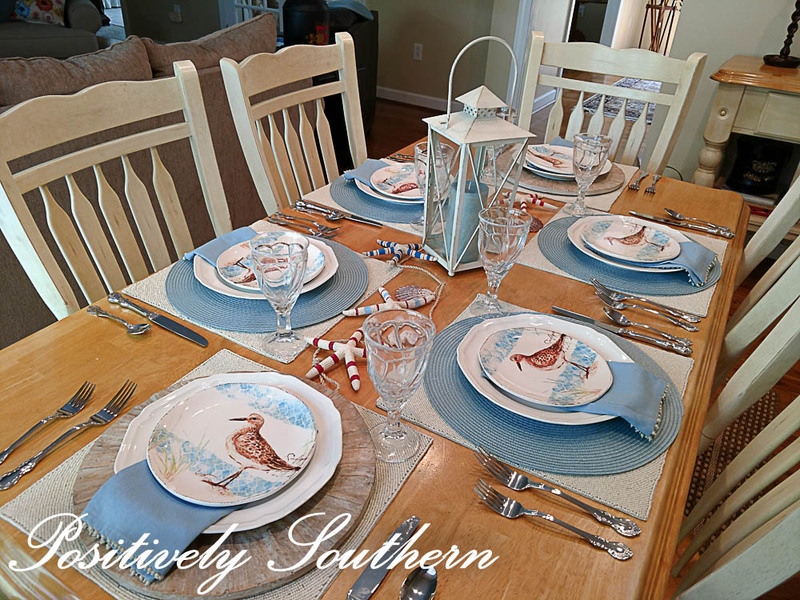 The color of the placemats are perfect match to the blue in my drapes. 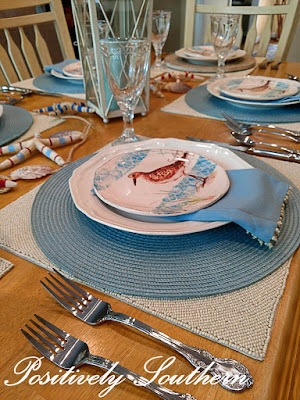 Consequently, those placemats also have an almost permenant home on the table! 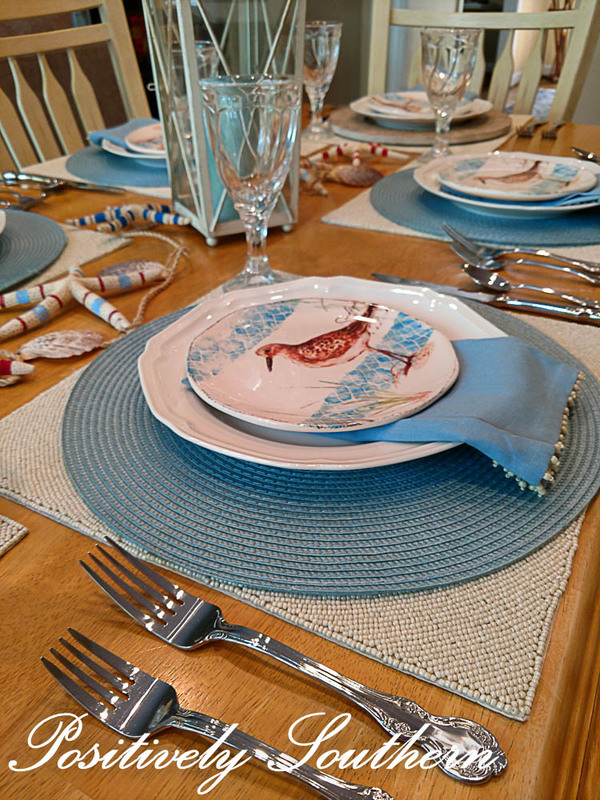 The napkins trimmed in delicate, tiny seashells add some whimsy to the table. For a centerpiece I've opted for one of my lanterns with a coordinating color candle. 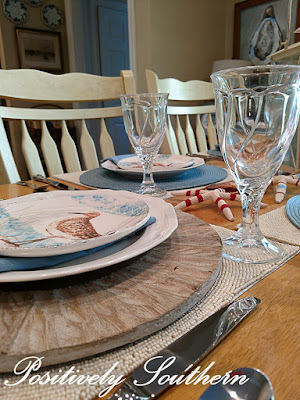 The starfish and seashell garland finish off the the center of the table. What are your favorite collections that you have around your home? I'd love to hear about those! I am so loving the Beach, Seaside décor. 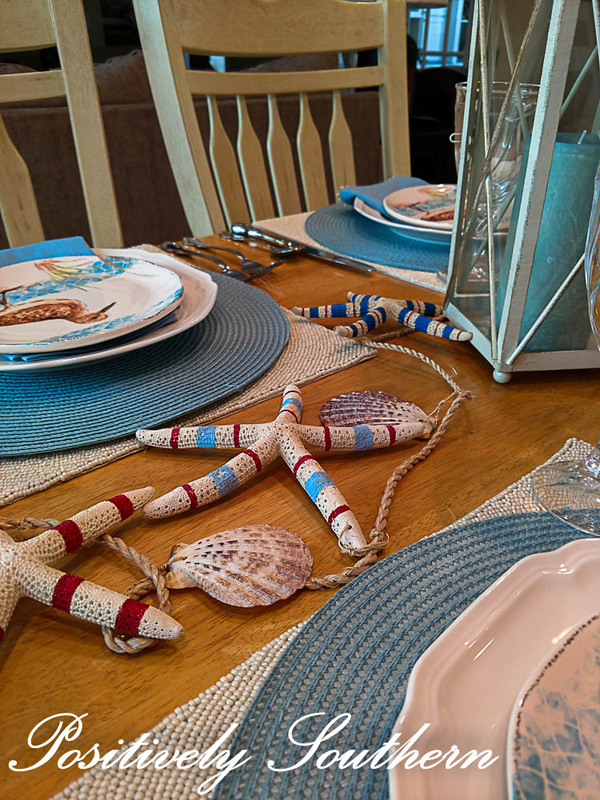 Your Beachy Tablescape is absolutely lovely. Hi Tamyra, I found your blog through Between Naps on the Porch, and I love your style! I wondered if you would share the paint colors you've used in your kitchen and family room? Dionne, let me first apologize for my very late response! The color for the family room and kitchen is Believable Buff by Sherwin Williams. The sandpipers are so cute! And the driftwood chargers are perfect. I liked that you used only two at the ends of the table.